If your business has kept pace with changes in wireless networking, you've deployed dual-band routers and client adapters that can stream encrypted data over the airwaves at speeds greater than 100 megabits per second at relatively close range. But no good deed goes unpunished. New hardware based on the nearly finished 802.11ac standard is about to debut, and it will make your existing wireless infrastructure feel as though it's mired in molasses. Though the standards body responsible for defining 802.11ac hasn't finished dotting all the i's and crossing all the t's yet, semiconductor manufacturers Broadcom and Qualcomm Atheros are already sampling 802.11ac chipsets (Broadcom has labeled its effort "5G Wi-Fi"). Both companies are closely involved in defining the standard, and they promise to deliver firmware updates to correct for any minor changes that may creep into the standard between now and the moment it is ratified (probably later this year or early in 2013). Wondering how the IEEE moved from 802.11n to 802.11ac? The standards body uses a new letter suffix to identify each new technical paper related to the 802.11 project, so the logical follow-ons to 802.11z were 802.11aa, 802.11ab, and now 802.11ac. The standard is dubbed "fifth-generation Wi-Fi" because it's the fifth generation of the technology that will be certified by the Wi-Fi Alliance marketing consortium. At the risk of muddying the waters, there is an 802.11ad standard in the works, but it's not the next step in mainstream wireless networking. WiGig, as that standard is known, is a short-range, line-of-site technology that uses the 60GHz frequency band to stream media. Unlike 802.11n networking hardware, which can use either the 2.4GHz or the 5GHz frequency bands, 802.11ac devices will operate exclusively on the 5GHz band. The 2.4GHz band delivers better range, but Wi-Fi data streams that use it must compete with a multitude of other devices that operate at the same frequency--everything from microwave ovens to Bluetooth headsets). The 5GHz band contains many more available channels; and in the 802.11ac standard, each of those channels is 80MHz wide, versus the 40MHz width specified for channels under the 802.11n standard. 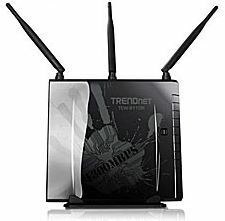 Trendnet’s TEW-811DR router will support 802.11ac. What's more, 802.11ac will use a modulation scheme that quadruples the amount of data that will fit on an encoded carrier signal. The maximum bandwidth per spatial stream in 802.11n is 150 mbps, which means that an 802.11n router outfitted with three transmit and three receive antennas can deliver maximum theoretical throughput of 450 mbps. In contrast, the maximum bandwidth in 802.11ac jumps to 433 mbps per spatial stream, and the maximum number of spatial streams increases from three to eight. So the theoretical maximum throughput on an 802.11ac network will eventually be several times that of gigabit ethernet. First-generation devices, however, will be limited to using either two or three transmit and receive antennas to deliver a theoretical throughput maximum of 866 mbps or 1.3 gbps). As we've seen with 802.11n networks, real-world throughput will likely be one-third to one-half as fast as the theoretical maximums. Still, even mobile devices outfitted with 802.11ac chipsets and just one transmit and one receive antenna--think smartphones and tablets--should be able to handle more than twice the bandwidth that today's devices with 802.11n chipsets can manage. With bandwidth-intensive applications such as videoconferencing and Customer Relationship Management (CRM) moving from the desktop to smartphones and tablets, 802.11ac networks will become essential infrastructure elements for businesses large and small. One means of overcoming the 5GHz band's shorter range with 802.11ac chipsets will be to utilize transmit and receive beam-forming technology. Beam forming was an optional and non-standardized element of the 802.11n spec. In the 802.11ac standard, beam-forming will remain an optional feature, but its implementation will be standardized. Most of today's 802.11n devices use omnidirectional signal transmission and reception. Signals propagate in a series of concentric rings, like the ripples you create by dropping a stone in a pond. With beam forming, the router and its clients develop an awareness of each other's relative location, so they can coherently focus their transmission streams at each other. Without beam forming, reflected signals may arrive out-of-phase and cancel each other out, reducing total bandwidth. A beam-forming chipset can adjust the signals' phase to overcome that problem, thereby substantially increasing usable bandwidth. The first generation of 802.11ac routers, such as the Trendnet TEW-811DR, will be concurrent dual-band models that support 802.11n clients on the 2.4GHz frequency band and 802.11ac clients on the 5GHz band. These devices are likely to reach the market in the third quarter of this year. Laptops with 802.11ac chipsets should arrive in time for the winter holiday season, with mobile devices such as smartphones and tablets following in early 2013. The Wi-Fi Alliance, which has assumed responsibility for ensuring that wireless networking products interoperate properly, plans to begin its 802.11ac certification program in early 2013. Editor's note: This story has been updated to reflect that beam forming is an optional, not mandatory, element of the IEEE 802.11ac standard.